We cartographers know that maps have the power to make features of the landscape visible or invisible in the public consciousness. A bike map emphasizes bike routes but doesn’t show you, say, forested and non-forested areas, while a USGS topo map shows you where a platoon could hide from choppers in the summer but not what streets have a low traffic volume. One of the things that some maps try to make visible isn’t things, but people. Census data provides a rich trove of demographic data to visualize, putting various categories of people “on the map” and powerfully impacting the way we think of the communities we inhabit. In the past few years, a popular way to do this has been through dot maps, where one dot equals a certain number of people and the dots are randomly placed within the census blocks where the corresponding people live. This trend follows the work of radical cartographer Bill Rankin, who points out that the more traditional choropleth maps “make a strong visual argument. They make it seem that human beings are naturally divided into relatively homogenous groups, separated by sharply-defined boundaries.” Obviously, in the real world this isn’t the case; people blend with each other across space. It’s all the more powerful, then, to see the smooth transitions of racial groups more accurately represented, and still note startlingly sharp divisions between neighborhoods. It’s one thing to talk about America’s persisting racial segregation problem in abstract terms; it’s quite another to see it writ large in crayola-box color, as in the below map of Madison put together in 2011 by the UW Applied Population Lab. But herein lies a rub: maps like this might better represent a phenomenon, but they can only be as truthful about it, at most, as the underlying data. Census maps of any kind may serve to make certain people invisible—those without addresses. The nonprofit organization Porchlight estimates that over 3,500 people each year experience homelessness in Madison. Can a map like this tell us something about who the homeless are? I was first struck by this question about two years ago, when I first saw the APL map at a statewide conference of GIS professionals. Staring mesmerizedly at the poster, I suddenly noticed a surprising incongruity. Why is that block blue? 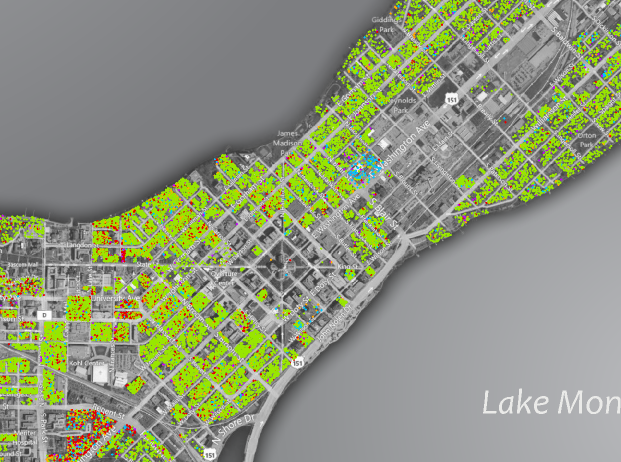 In a sea of green dots representing white people, one census block was populated almost entirely by blue, representing African-Americans. Living in a U.S. city, you come to expect such segregation at the neighborhood level, but a single block? What was going on here? This block in particular happened to be across the street from the apartment I was living in at the time, and I knew that it was not a very residential one, but was home to businesses and light industry. I thought through my mental map of what was there. A Goodyear garage. A warehouse? A post office. 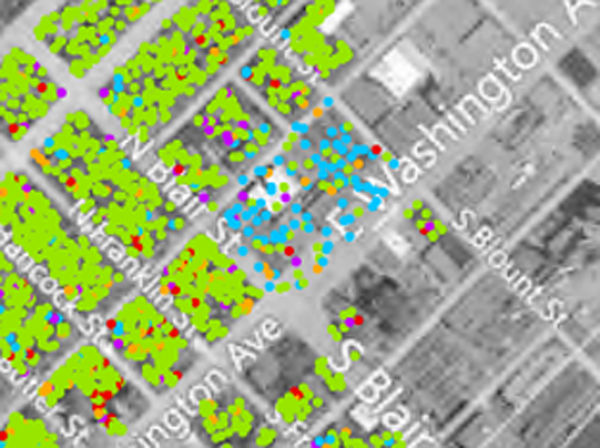 It struck me that there was a USPS carrier annex somewhere along that side of East Washington Avenue quite close to my apartment, and I came to the conclusion that all those blue dots must represent mailing addresses that few people with homes would use, i.e., P.O. Boxes. I called up the Salvation Army, and the woman I spoke to informed me that yes, they did have “quite a few” people who received mail there; she wasn’t quite sure how many, but estimated 20-50 at any given time. But I count 131 dots on the block. There also is a 32-unit upscale condo development on the back side of the block facing Mifflin Street completed in 2008, although with units going for $190-$400K during the big real estate crunch, I’m going to guess they weren’t quite full up when census workers came around in 2010. Perhaps the Salvation Army’s social workers were helping people who didn’t usually get mail there fill out census forms as well, using their address? It also seems likely that many of those 20-50 individuals have dependent children who would have been reported on the forms. If we had the individual addresses on the forms, we eliminate the condo-dwellers and see for sure who was relying on an institutional address. One thing we can say with some confidence, though, is that most people belonging to the latter category were black. And that says something about who is homeless in Madison.